Last time I wrote about the significance of the album cover to Bo Diddley's Bo Diddley is a Gunslinger (Checker, 1960; pictured in the blog entry below). I observed that Bo Diddley wasn’t the first black musician to appropriate the iconography of the American West for an album cover; as Michael Jarrett has pointed out, jazz great Sonny Rollins did that, with Way Out West (Contemporary, 1957). Subsequently, the association of the popular musician with the myths of the American West--in particular, the musician as outlaw hero--became a significant one in the 1960s. I suggested that by appropriating the image of the outlaw hero for a generation of rock ‘n’ roll musicians, Bo Diddley became an iconic figure of rock 'n' roll, not simply a musical inspiration. Bo Diddley's album was released at the beginning of the 1960s. During the decade of the 60s, through a process that Robert Christgau calls a "barstool-macho equation of gunslinger and guitarschlonger," the musician as outlaw was formed, and his image, formerly associated with the values of the bohemian subculture, became, according to Michael Jarrett, "an icon recognized by all and embraced by many" (200). According to Robert Ray, the musician as outlaw stood for "freedom from restraint, a preference for intuition as the source of conduct, a distrust of the law, bureaucracies, and urban life" (255). Outlaw iconography became a metaphor for individuality, integrity, and self-reliance. In addition to albums such as The Byrds' Sweetheart of the Rodeo (1968) and the Eagles' Desperado (1972) that I mentioned last time, we can also add the following albums and songs. 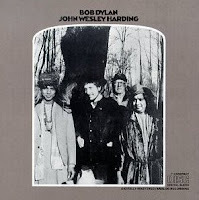 Perhaps a key album in the development of the popular musician as outlaw hero was Bob Dylan's John Wesley Harding (1967), in which he merged his own biographical details with the figure of the notorious Texas outlaw. Hence Jimi Hendrix's decision to cover "All Along the Watchtower" is much more deliberate than it at first may seem. The following list of albums with frontier imagery is not intended to be an exhaustive list, merely an indication of how widespread was the appropriation of the imagery of the American West. Reggae musicians adopted the image of the outlaw hero as well: the late Jimmy Cliff with The Harder They Come (1972) and The Wailers with "I Shot the Sheriff" (1973). The so-called "Outlaw" movement in country music picked adherents as well, such as David Allan Coe, with his album Rides Again (1977). And, eventually, even a rock band from the American South named itself the Outlaws. 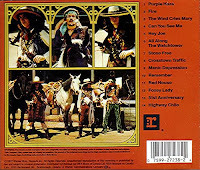 The eponymous first album of the Outlaws was released in 1975, by which time the musician as outlaw was well over a decade old.